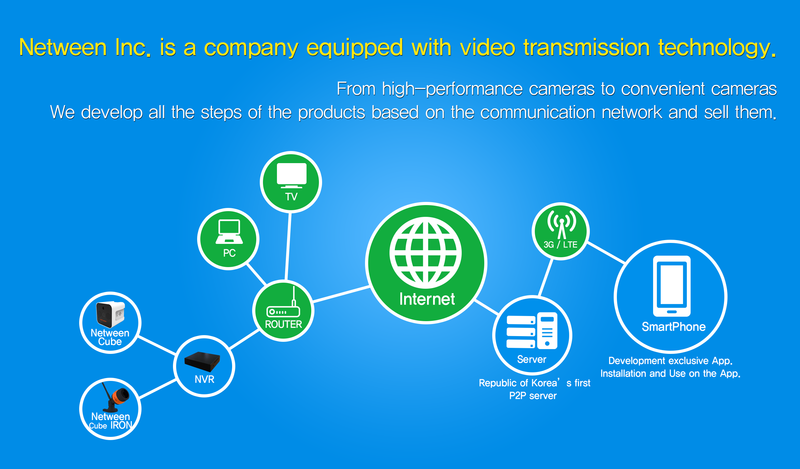 Netween Inc. is IP CCTV Total Solution Enterprise. We develop, manufacture, and sell our products for the entire process throughout H/W, S/W, server, app, and design. Are you sure you checked that it is a company that only imports and sells cameras or a company that only operates servers or a company that only develops apps? Reliable brand, reasonable choice is Netween Inc.
Why should it be Netween Inc.? Netween Inc. is not a company that imports and sells products developed abroad. Availability of rapid product improvement, A/S, CS through direct operation of all processes. Check out reasonable prices, less distribution channels, and economical brand. It is not product for sale once. Netween Inc. pursue the continuity of our products by innovating our products based on the technology we need for the entire development, production, and process of our products. Netween Inc. makes life easier through smartphones. The human invented the needle, made the cloth, and the garment industry was spread out. By inventing the leverage, the construction business has developed through the crane. Netween Inc. is making the wider world convenient by the smartphone that every man and woman has.